On a nippy Sunday evening in mid-January, about 20 people filled the pews of St. Joseph's Co-Cathedral lower chapel in Burlington as Reverend Lance Harlow performed mass in French. White fluorescent lights shone brightly from the low ceilings. Incense wafted through the air. "Hosanna, hosanna, hosanna." Christelle Bakala's voice rose above the clanging pipes. The Congolese woman held a song sheet and swayed slightly as she intoned the words. The rest of the mixed-age and predominantly Congolese congregants sang after Bakala and clapped their hands to the beat. Harlow waited for them to finish singing before he performed the Eucharistic Prayer. 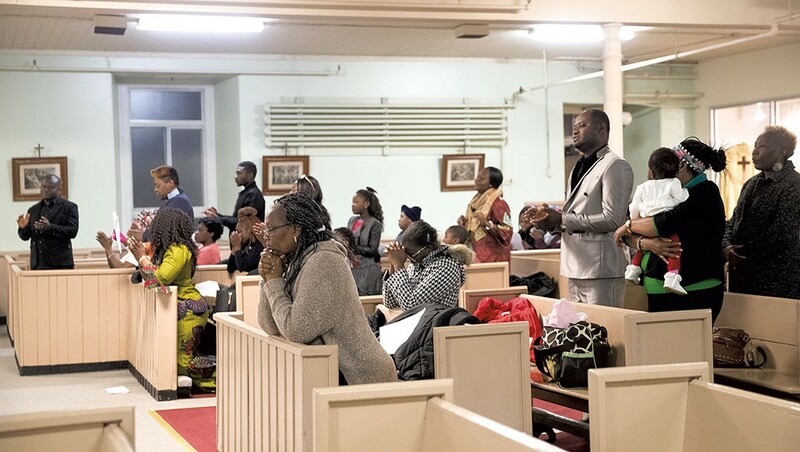 The African congregants are members of the Roman Catholic Diocese of Burlington's newest ministry, La Maison Blanche. French for "the white house," the ministry takes its name from a nearby building owned by the diocese. 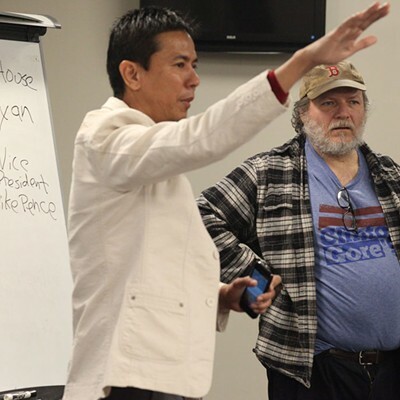 It's one of a growing number of local gathering spaces created by and for New Americans. These regular meet-ups may range from a church service to a citizenship class to a more casual hangout, but they all reflect a community's traditions and heritage while offering opportunities for social interaction. And they were all initiated by members of that community itself. The first time Harlow performed mass in French was in September of last year, two months after he was appointed rector of two Burlington parishes. "I was very nervous, because that's not my native language," Harlow recalled. The clergyman used Google Translate to look up some vocabulary. "And I prayed a lot," he added. While Harlow presides over the services, the driving force behind La Maison Blanche is Congolese ophthalmologist Jules Wetchi. 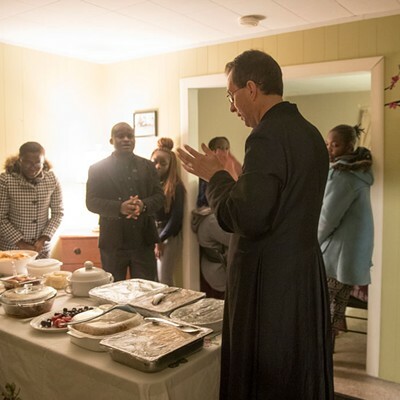 He formed the group in November 2016 to help French-speaking African immigrants and their children preserve their Catholic faith and native culture as they adapt to the ways of their new home. Wetchi, now a Burlington resident, was president of the Roman Catholic Archdiocese of the Children and Youth ministry in Kinshasa, Democratic Republic of the Congo. In Vermont, to which he emigrated in 2013, he was dismayed to find that some African Catholics no longer practice their faith. One reason, he said, is the language barrier. Few churches offer services and classes in any language but English. 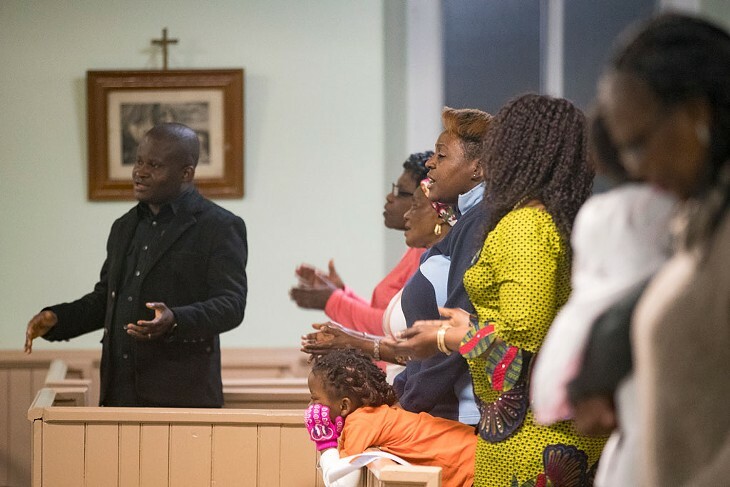 Some Catholics, Wetchi added, had started attending an African Protestant church that offers services in English and French in addition to social assistance. To remedy that situation, in 2015, Wetchi started a prayer group composed of 10 families from Congo, the Democratic Republic of the Congo, Côte d'Ivoire and Tanzania. They visited one another's houses every other week to read the Bible. 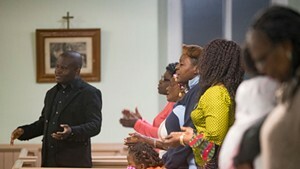 After a year, however, Wetchi decided the African community needed to be better integrated into the diocese, so he persuaded Harlow to perform mass in French once a month at St. Joseph's. The prayer group also now meets at the chapel. When Bakala moved to Vermont in 2004, she remembers, she was one of just a few Africans in Burlington. While she continued to attend church, she felt "something was missing" and longed to be part of a community. "It was very hard, because you don't know many people," she recalled. Today, Bakala is delighted to be part of a "big family." She wants her young son to have the kind of Catholic upbringing that she did in Congo. Bakala wasn't the only one who brought a child to the French mass. Astrid Mwali and Lyliane Nzili also came with their families. Both Congolese women moved to Vermont about two years ago. Speaking through a French interpreter, they said mass in their native country is about "adoration" and "jubilation." "Here, the [English] mass is very calm and tranquil," noted Nzili. "Sunday is the day of glory," Mwali said. 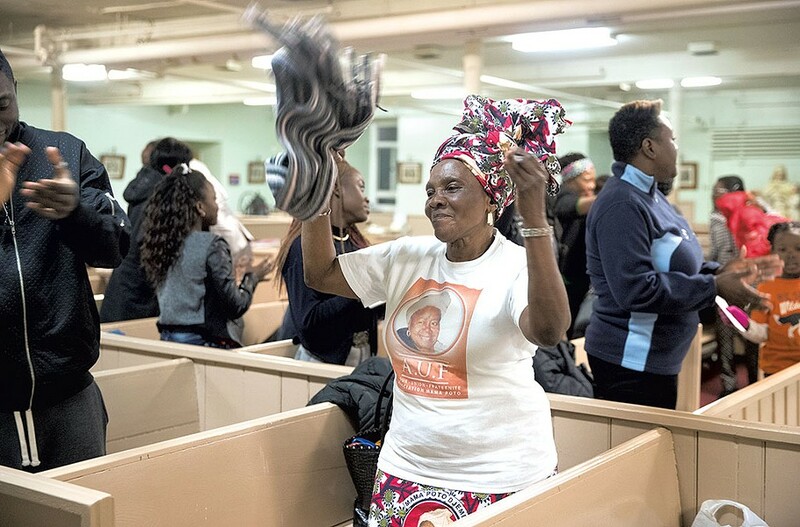 It's common for congregants in Congo to dance along to the songs of praise, she added. At La Maison Blanche, she feels free to use her body to express herself. 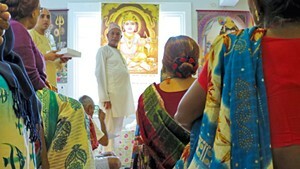 Being able to understand the mass felt "really good," the women said. On days when St. Joseph's has no French mass, the women and their families attend St. Mark Catholic Parish in the New North End or the Chapel of Saint Michael the Archangel in Colchester. Mwali and Nzili admitted that they don't always understand the English services. Nzili's daughter sometimes translates for her mother. During mass at La Maison Blanche, the congregants sing not just in French but also in Lingala and Kikongo, indigenous Congolese languages. Since Harlow doesn't speak those languages, he looks to Wetchi for his cue to resume delivering his service. Despite his own language barrier, Harlow is committed to serving the African congregation. His main mission, he said, is to instill in them a sense of belonging in Burlington — "and part of that is to welcome them in their language." While La Maison Blanche brings a community together for religious practice, other New American-initiated gatherings have a secular focus. 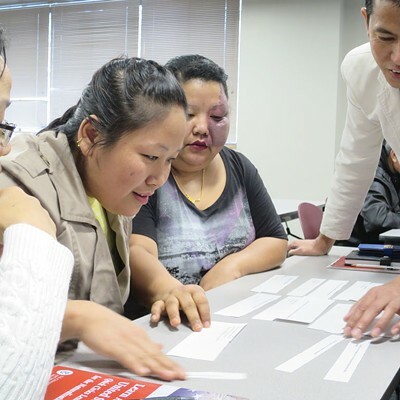 For example, every Saturday morning, Hemant Tamang-Ghising leads a citizenship class in the Burlington Police Department's community room. His lessons cater to Bhutanese adults who have to work on weekdays and can't attend classes organized by other service providers, Tamang-Ghising explained. "Even if you have [the class] at night, it's very hard for them," he said. "They feel tired some days. It's not helpful for them." Tamang-Ghising has permission to run the class at the police station until May, he said; thereafter, he'll have to find a new location. Organizing such a gathering is "quite challenging," he noted. Although several organizations are willing to share their space, it's usually subject to restrictions. Across the river on Winooski's Main Street, the office of the Somali Bantu Community Association of Vermont offers something closer to a traditional American community center. Usually it's the boys and men who gather there in their leisure hours, and it's liveliest on weekends, when they drop by the office after soccer practice or work. The association's office has two sections. The main hall is lightly furnished, and a glass cabinet holds trophies won by the local Juba Star soccer team. Photographs of the players adorn a wall. The other section is smaller, with a computer laboratory for younger guests. "They don't leave until 2 a.m.," said Noor Bulle of his fellow community members. A section of the main hall has been turned into a barber corner where Bulle cuts hair for free. "You can be 80 years old or you can be a year old. We'll say, 'Welcome.'" "Here, we have friends. Instead of watching TV, you talk to people," said Abdul Ali. "There's more fun here than at home." 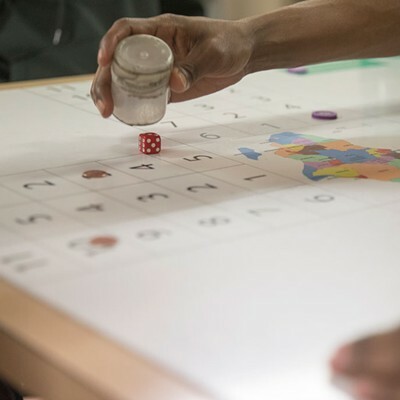 Whenever Ali visits the center to get a haircut, he doesn't pass up a chance to play laado, the Somali version of ludo. "We got beaten. They're making fun of us," Ali grimaced, before making his way home. Most conversations at the office are in Maay Maay, and laado is the most popular activity. Only four people can play the game at any one time, but the spectators are no less active. They offer advice — often unsolicited. A game can be as short as 20 minutes or as long as two hours. Sometimes things get so intense that elders such as Ahmed Kerow intervene to calm the players down. While the game is central, the office isn't just for recreation. Kerow said he's more apt to go there to get help with reading his mail or to counsel couples. 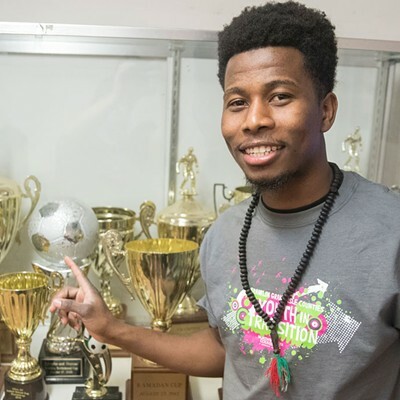 Bulle, who works for the Multicultural Youth Program at Burlington-based Spectrum Youth & Family Services, said the office is an important resource for the community. 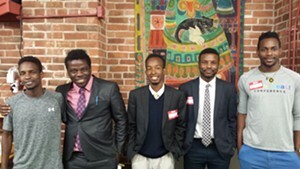 Gathering and interacting there can help "heal" the Somalis, most of whom arrived in the Green Mountain State as refugees. "I cannot share my stories [with other people]," Bulle said. "They don't have any idea about me, my struggles, how I grew up. Only these men understand me." A dedicated community space also keeps the youth off the streets, Bulle said. His friend Abdirahman Maalim agreed. By his own admission, Maalim used to "hang out with people who did bad things" when he was in his late teens. At the urging of community elders, he started spending time at the office instead. That proved to be a turning point in his life, Maalim said. 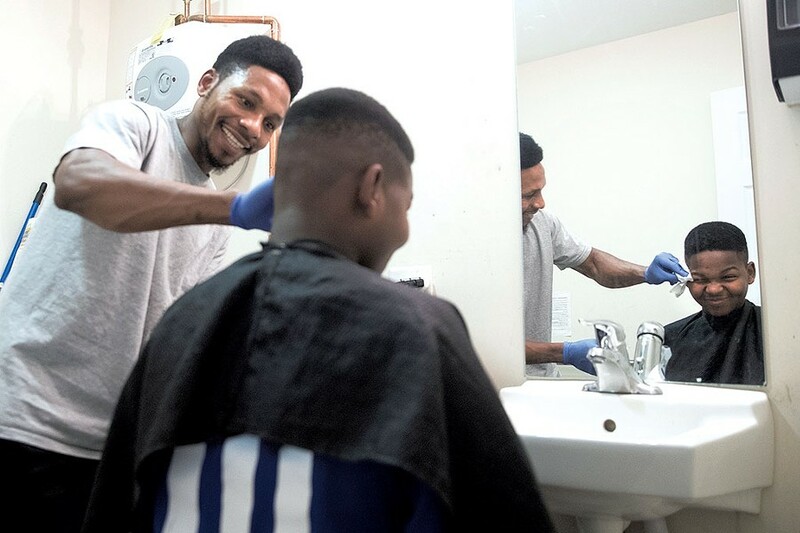 "[The office] kept me [and] a lot of people off the streets," said Maalim, now 24. "I would recommend anybody to come here." Today, although the father of two works the evening shift, he makes a point of coming to the office every Saturday and Sunday. The price of a space the Somalis can call their own is hefty, said Bulle: $1,250 monthly to keep the office running. He pitches in and contributes between $50 and $100 each month. 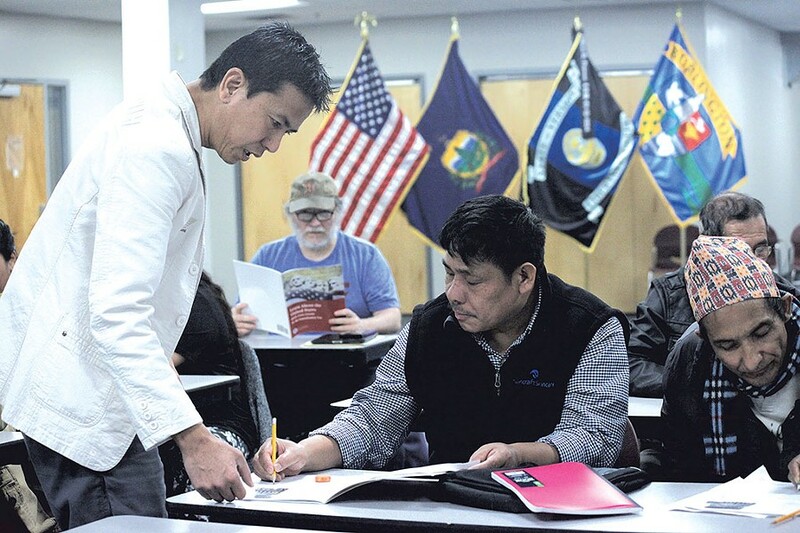 "Our pockets are crying right now," he said, adding that it's worth it to maintain a home base where community members can preserve their culture and get assistance with daily life. It's the kind of one-stop center that Wetchi of La Maison Blanche hopes to build. There's so much about American systems and culture that the congregation still has to learn, Wetchi said: "We need to bring the information to them." He's working with Susan Wing, former executive secretary to the bishop of the Diocese, to convert the white house for which the group was named into a pastoral center. There, members will be able to attend English conversation classes and catechism lessons, as well as get advice on connecting with other service providers. "As Catholics, we are called to welcome the stranger in our midst," Wing said. The original print version of this article was headlined "Community Centers"